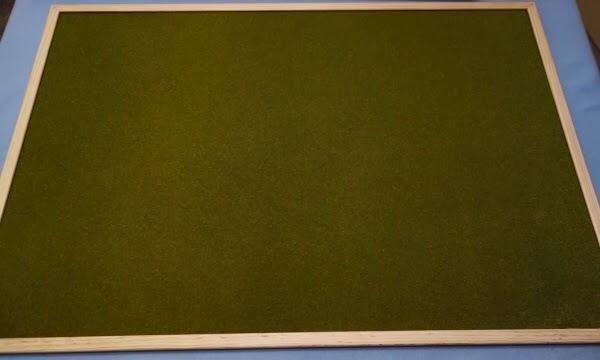 1st Monthly update of the pinboard project. This is the first update on how this project is going. For those new to the project, you may want to read the original post first, so that the following can be seen in context. Since the pinboard itself is somewhat central to the project, I shall start with that. I had bought the MDF version of the board with the intention of coating it with a mix of sand, filler and paint and then doing some dry brushing when dry. This would (possibly) have looked nice but would cause some minor problem for small terrain items to sit on it nicely (I am thinking of roads and streams here). To read the full post, please click below. 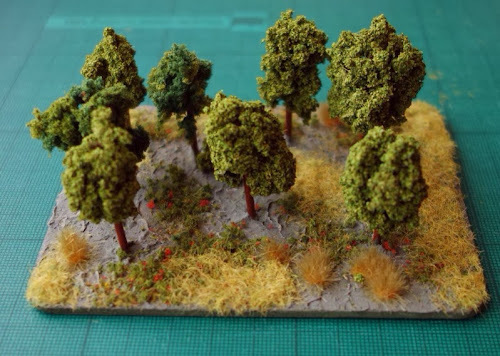 Anyway, while in Hobby Craft (UK), I came across the 'Ready Grass Vinyl Mat' from Woodland Scenics in 'spring grass' colours. 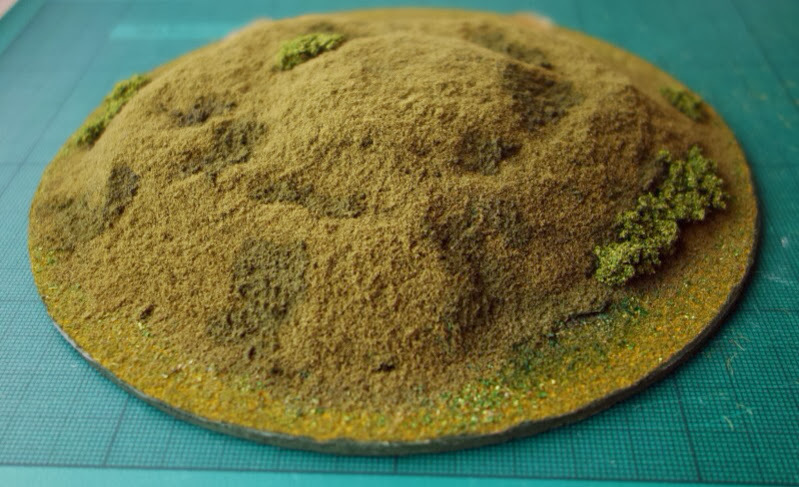 This has a tight coating, unlike the grassy stuff on paper backing that is commonly found in model shops. It was £13, but I thought that it might actually work out more cost / time effective compared to doing the filler / sand thing. Being a vinyl mat, I decided to glue it onto the bare MDF side of the board rather than the whiteboard side, as I thought the PVA glue would struggle to dry out otherwise. I put the board onto the matting and cut around it to get a rough size for the mat. I then repeatedly cut off 1mm sized strips until I got it to to be just slightly larger than needed. There is a gap under the frame, so you can 'tuck in' the mat under the frame. This way you can cut the mat slightly oversize rather than risk cutting it too short on one or more of the edges. I left it out flat to dry for 3 days, just to minimise any warping. Despite all my efforts, I ended up with a few quite noticeable (especially when light came in from the side) air bubbles under the mat, so having done all of this, I think if laying this mat again, I would instead use a piece of board and tack the mat onto it with carpet tacks nailed all around the edges. Anyway, I tried to rescue it (slice, glue and flock) but just made it worse, so I tore off the mat and noticed that virtually none of it was glued tightly to the board, so maybe this vinyl mat needs a special or at least better glue (EDIT - today I noticed that the store sold a Woodlands Scenics glue specifically for the vinyl mat). My latest solution has been to buy some of that thin anti slip matting sold in carpet shops that goes under rugs to stop them slipping on wooden floors. A small piece cost me £5.50 and I bought a roll of double sided carpet tape costing £1. I cut the mat to size and then using the double sided tape, anchored the mat to one of the short edges, then taped the other short edge and fastened the other end of the mat. I did the same to the two long sides, keeping the mat flat but not too taut. Once fixed down, using a craft knife I carefully trimmed the excess (it is difficult to cut) and in places, I was able to push some of the excess under the edge of the pinboard beading. I then made up a mix of light brown slop from emulsion paint from a tester paint pot, a squidge of cheap acrylic paint, another squidge of thin PVA glue and a very small amount of water (about 1cm in the bottom of the tester pot). This was mixed well and applied to the board with a 3" cheapo craft brush. I deliberately did not soak the material with the paint (several light brushings is better than a heavy coat), so it looks very blotchy after the first application. I was left with an amount of mix that was able to re-fill the tester emulsion pot, so that I could save the mix for a second coat the next day. The material feels sort of rubberised, so the paint does not go on evenly (or easily!) and does need several applications, but overall this is good because you end up with a mottled effect. After the second coat, I switched from brown to green and just did two more brushings, with the added PVA helping to 'set' the surface. I bought the green acrylic from an artists shop (student quality), so that I could use the left overs on figure bases, to help them blend in with the board. Anyway, I am happy with the results. (Edit - as indicated in the first post, I also have a piece of 2' x 3' proper pinboard material set to one side for marking up with a 5" hex grid, on a 7 x 5 pattern, more on that in future posts). Budget update: I was budgeting for around £20 a month, probably unrealistic as I have already exceeded that this month. Some of the things have been essential building blocks to the project, such as getting the board done, but others are just things that I have picked up along the way that are quite ancilliary or even mistakenly bought (i.e. failed good ideas). For the purpose of these posts, I will just show the costs that have been mostly necessary to the actual success of the project, just so the reader has a realistic idea of costs that they may face. I am also accepting that most of us will already have some materials / tools, even paints and brushes to hand. Obviously money can be saved, especially if you just want to explore whether this sort of thing is for you or not. 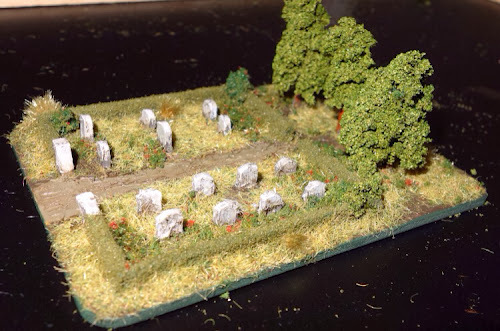 So for example, instead of buying figures, just used bare card bases and instead of resin rivers, very cheap and effective rivers can be made from strips of felt from a 50p square that hobby shops sell. 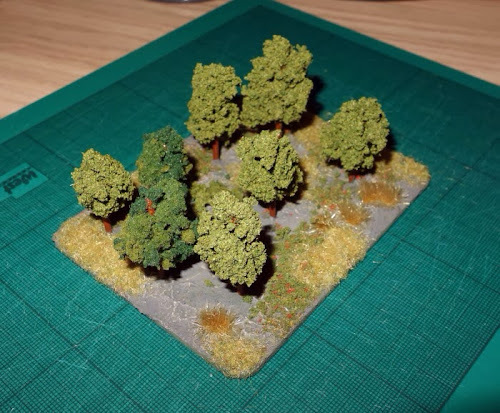 Terrain update: A fairly easy, but effective piece for this scale is light woodland or orchards. There are just four parts needed. (1) a base. Heavy card, 2mm MDF or thin ply are good base materials. (2) tree trunks, cut down cocktail sticks are fine. (3) foliage, clump foliage is the ideal material, though I have even used painted cotton wool in my cash strapped days. (4) basing materials, the base can be dressed to any standard of your choosing, from the materials you have at hand, from basic painting or flocking to textures and grasses being added. Process: Provide the base and drill out holes for where the trees will stand. 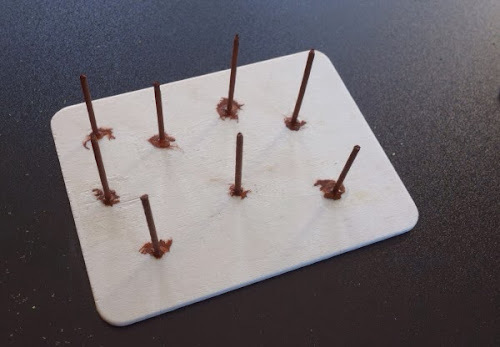 Cut cocktail sticks down to a realistic height (30 - 40mm) and get rid of the pointy bits. Glue the sticks in the holes (place the base on paper, so that glue does not stick to the table). Paint the tree trunks a basic brown colour. Next, mix some filler with some dark cheap paint (for tinting the white filler and keeping the mix loose) and then sprinkle in a small amount of old rough flock or even fine sawdust, to add a bit of texture. Apply the paste to the base thinly to prevent warp and ensure the paste has lots of form, not spread flat like icing on a cake. Leave to dry. Lightly dry brush the textured ground with a light colour. Put a good glue (I use UHU general glue) on the top half of the tree sticks and let it go tacky. Apply the clump foliage as a wrap, adding extra glue and clump if needed (you will, this can be frustrating to get it all to stick properly) and leave for the glue to properly harden. Dress the base as you see fit. I used clump turfs, scatter and grass, using PVA for the bond. Do it in an irregular patch-work fashion to break the base shape up. Finally, spray (or use a loaded brush to dribble it on) on some diluted PVA to lock down all the foliage and flocks or use a spray fixative (artist shops sell it to 'fix' charcoal). I did both, glue and then fixative when dry. Some people use hair spray as a fixative, but I'm really not sure whether those chemicals could cause any future problem with the materials we are using. Next up I used a similar base and process to make a graveyard. 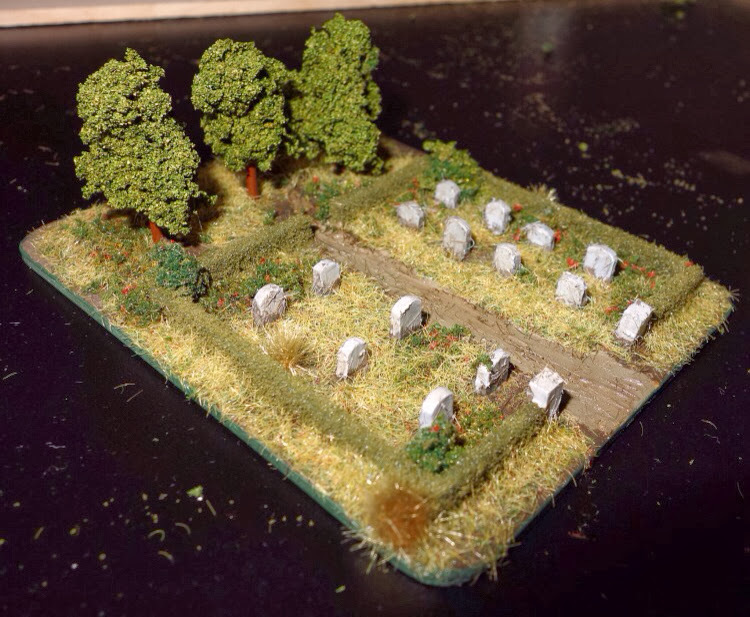 The grave stones are made from the ends of mini lolly sticks reduced in width and the surrounding hedging was formed from a balsa wood frame. Undercoat the framework as shown below. 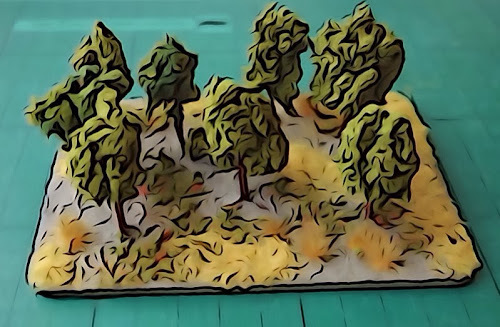 I added flocks and clump foliage to the balsa frame and then dressed the ground in a similar fashion to the woods previously mentioned. The graveyard is intended to sit next to a church building or similar. 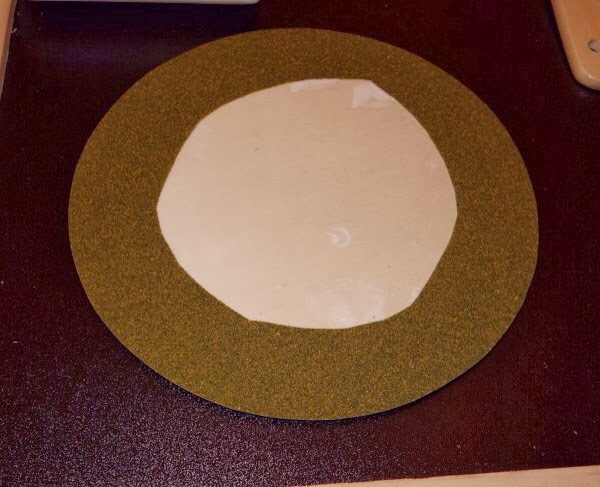 Process: I glued a ring of the vinyl mat (an off-cut left over from doing the board) to the base. This was to help the feature's edge blend in to the playing surface, but as noted above, that original mat is now in the bin - so I will later drybrush the feature to help it blend with the updated board. I kept the middle bare, so the next part had a better gluing surface. I carved some of that 'oasis' foam that flower arrangers use into a hill top shape. This foam type material doesn't warp but is not particularly nice to handle. I mixed PVA glue, some paint from a cheap emulsion tester pot and some water. Keep the mix thick, you don't need much. 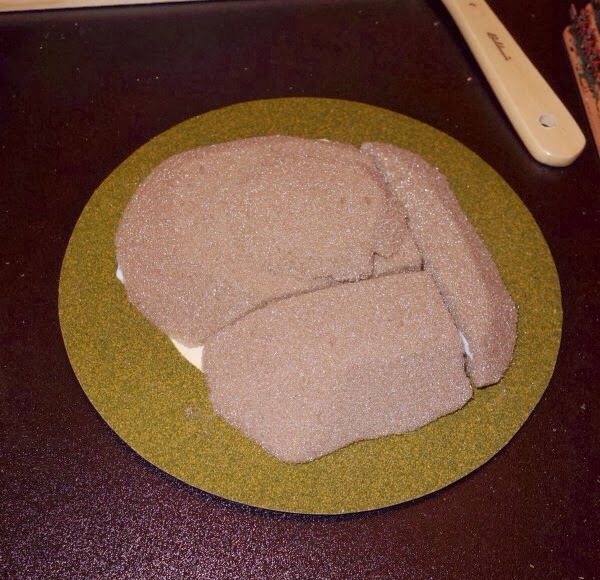 I took a couple of sheets of kitchen paper towel, ripped them into smaller bits and dabbed the mix on and then added them to the feature in a sort of paper mache technique. Once dry I coated the paper tissue with plenty of PVA glue and sprinkled on cheap course flock to cover all the horrors of crumpled tissue and left it to dry. In my mixing tray (old ready meal dish), I made up another mix of PVA, paint and water and applied it generously all over the dried flock. I then liberally scattered my favourite flock onto the feature (Woodland Scenics Fine Turf Burnt Grass) and left to dry. The edge of the plywood was painted a green to match the playing surface. Finally I glued 'foliage clump' in strategic places for good looks and to hide any final horrors that still caught my eye. 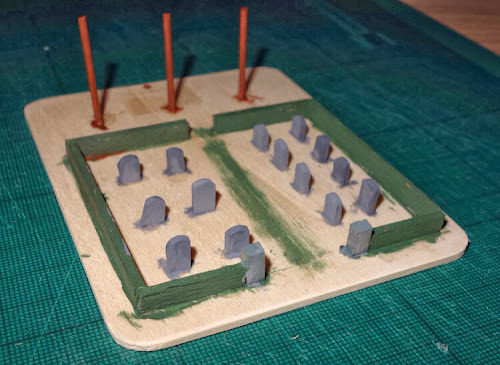 The feature has quite a few undulations, but the flash on the camera blows them out, so to reinforce the shading (and help with the below photo), I made a watery mix of dark green paint and put it into the hollows and dips. Once dry, I gave it all a quick blast of fixative spray. Troops update: Having painted the Empress Dragoons last month, I still had Napoleonic artillery and Old Guard foot from my initial sample purchase to paint. I painted the gun crews first. I coated them in satin varnish and then applied a weakened mix (50/50 with water) of Quick Shade soft tone ink. They looked good when wet, but I was really disappointed when this dried, as my figures looked really flat and dirty and so I think it is better to use this ink on larger figures. I used to use Winsor and Newton Nut Brown ink and floor polish, so I don't know whether to revert to that or whether just to leave my 6mm bright and put a satin varnish on them. I had to do a re-touch on the crew to rescue them. For my monthly figure order, this time I sent off to Heroics and Ros for some T-34 and Pz IV tanks, together with some German / Russian infantry and support weapons. By time they arrive and get painted, they will probably appear in my next post (which is why I have cracked on with some terrain making). Likewise the river sections and bridges from Baccus 6mm should make an appearance in the next post. I also have some 10mm from pendraken. I ordeded a T-34 tank, 1 bag of Russian infantry and 1 bag of French 1809 Napoleonic infantry to paint up and compare with the 6mm. Rules and systems update: For WWII, I ordered G.I. Commander from Heroics & Ros (just £2.50) as I remember seeing these at a wargame show and regretted not getting them, so I added them to a figures order. As it turns out, I'm not that keen on them as they look quite dense and are rather data heavy (some will admire them for that alone). 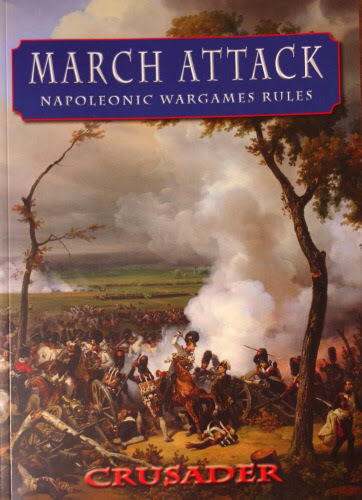 From the Two Fat Lardies, I downloaded the Le Feu Sacre PDF (£7) for napoleonics and I got an excellent deal on e-bay for Force March by Crusader Games for a nifty £6.50 post free (also for napoleonics). 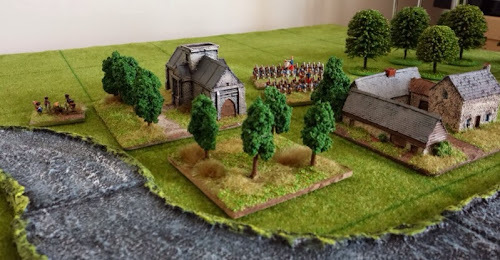 I already have the Polemos Napoleonic rules as a download and I am still wading through rules as I write this, so have not set myself in any sure direction for basing etc this month. For WWII, I prefer each stand to be a single tank or a full squad, including the section light machine gun(s). For napoleonic, I am not sure what to do. I like the idea of the single stand representing the formation (as in Polemos), but I also like the way March Attack has a battalion split into two bases so that column, line and square can be represented. Either way, I will probably go to smaller frontages, so that the pinboard can get more action into it. I will probably do a few practice games with blank bases, testing mechanics etc while I try and decide what to do. In the back of my mind is the consideration of going to a square or hex grid - this of course is a distraction to the original simple plan, but I do like grids, having a substantial grounding in board games. I already have a developed WWII tactical system (in DTP format) for a 9 x 6 grid game, so I could experiment with that. If I did do grids, I would want them to be fairly large, to help keep the aesthetic of the battlefield. I don't want to spoil the board by putting a grid on it, if I am ultimately not going to use it, so just in case I want to test squares, I bought some drawing pins and string to go on standby, so that I can pin the board edge and then stretch the string over the board to make the grid by looping around the pins. Below is an old shot of a grid experiment that I did some time ago for the napoleonic period in 6mm and stupidly, when the project stalled, I got rid of everything, including the terrain pieces - I really must learn to stop doing that! Note, that river is about twice as wide as the Baccus one that I have ordered and on this size game board - that matters. 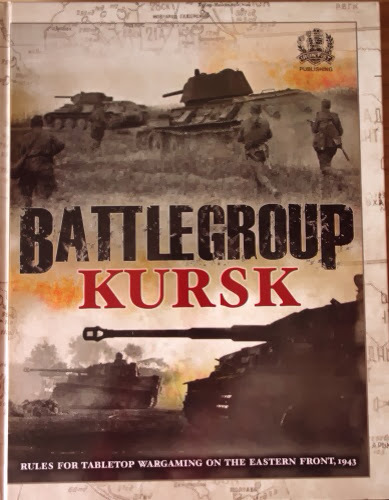 Treats: I was not able to attend the Vapnartak (York) wargame show earlier this month, which is a favourite venue on my calander, so to console myself, under the excuse of 'this is what I saved on petrol and eats by not going' arguement, I bought Battlegroup Kursk rules (£30), a hard bound, 240 page, beautifully illustrated set of rules for the Kursk period. Not sure If they will help the project, but they do use short weapon ranges with measurements in inches, so a conversion to centimeters is already looking promising. It uses individual infantry figures, which never (in my humble opinion) look good to my eyes in 6mm scale, but maybe staying with squad bases and noting casualties might makes things work out (it does though split the German squad into rifles and light machine gun teams) - who cares! it is just a lovely thing to own. I am also enjoying the board game 'Ghost Panzer' (WWII tactical, mentioned elsewhere in this blog) at the moment, so I am thinking about doing a conversion page to get this system onto the pinboard..... yet another distraction! Well, that rounds out a fairly active month. I am quite pleased with the progress of the project, which I remain enthusiastic about and hope to have more to share with you in a months time. Please check back again for next months (hopefully cheaper) update. Careful - you will turn into a rules junkie! The terrain and mat is coming along really well. I did not realise (or have forgotten) that you would be using the gaming table for Napoleonic and WW2 as well. I have loads of WW2 rules and have just begun scoping out replaying anywhere from 10 to 30 of them (similar to yours criteria - 1 base = 1 team/squad) over the next few years using 6mm on a 20'x30' board I cut out over the Christmas break. I continue to enjoy reading about your project and also look forward to what rules you play. BGK would be a bit hard I would think to do in 6mm with bases. There are loads of rules that should suit better. Hello Shaun, I have just started reading BGK, which is a lovely production, but I dont think that I want to do the record keeping with my infantry that would be based as full squads. I'm also not keen on rules that need you to buy multiple volumes to get other vehicle stats etc. They have quite a few similarities to my own WWII rules (that uses a 9 x 6 grid), which of course still remain an option. I am just painting up my Baccus 6mm rivers and I think size wise, they should work on the pinboard quite well.